This is the first poster for the upcoming Dragonball movie. As a huge fan of the series, I can't do anything but look at it with fear and loathing. I think the trouble is that the characters in the anime look too cartoonish to be live-action. 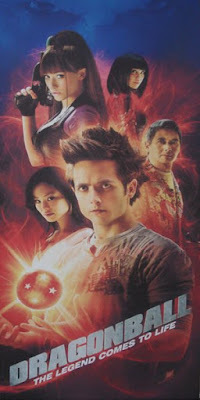 I mean, I've never seen someone and thought to myself, "Man, that guy looks exactly like Goku!" Seriously, this whole thing is giving me visions of the Street Fighter movie. You are not a true fan Yuri. Can't wait! !